A Great Western HST approaching Great Cheverell on its way to Westbury. The Reading to Taunton line is a major branch of the Great Western Main Line from which it diverges at Reading railway station. It runs to Cogload Junction (east of Taunton) where it joins the Bristol to Exeter and Penzance Line. 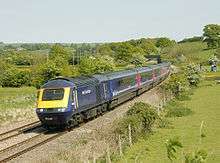 Since 1906 it has served as the principal route from London to Devon and Cornwall, having been created by the Great Western Railway joining up several earlier railway lines. These included the Berks and Hants Railway from Reading to Hungerford and part of the Wilts, Somerset and Weymouth Railway from Westbury to Castle Cary. The whole route is sometimes confusingly called the 'Berks and Hants Line'. The line became a through route on 2 July 1906 with the completion of the Langport and Castle Cary Railway. Before this, from 5 May 1848, through trains from London to Plymouth had run via Bristol: a longer route, often called the "Great Way Round" leaving only a few train services commencing east of Bristol running to Exeter via Bristol. The Reading to Hungerford section was promoted as the Berks and Hants Railway; from there to Patney & Chirton by the Berks and Hants Extension Railway; and from Westbury to Castle Cary by the Wilts, Somerset and Weymouth Railway. The section from Cogload Junction to Exeter was built by the Bristol and Exeter Railway, whose Yeovil branch became part of the new main line between Curry Rivel Junction and Athelney Junction, and including Athelney station. 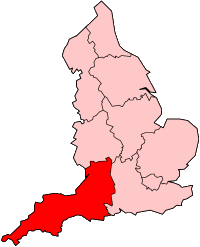 The section between Exeter and Plymouth was built by the South Devon Railway Company. These nominally independent companies had all been amalgamated into the Great Western Railway by 1 February 1876, and the remaining 7 ft (2,134 mm) broad-gauge lines were closed on 20 May 1892 and converted to 4 ft 8 1⁄2 in (1,435 mm) standard gauge over the following weekend. A series of cut-off lines were constructed during the following 15 years, establishing the present through route. The Great Western was nationalised on 1 January 1948 as part of the new British Railways. In 1977 the Parliamentary Select Committee on Nationalised Industries recommended considering electrification of more of Britain's rail network, and by 1979 BR presented a range of options that included electrifying numerous Great Western routes including Reading to Taunton line by 2000. 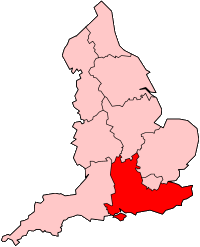 Under the 1979–90 Conservative governments that succeeded the 1976–79 Labour government the proposal was not implemented. Resignalling in the 1980s enabled faster running. This was followed by privatisation in the 1990s, with the line being transferred first to Railtrack and then to its successor Network Rail. After Reading railway station the line curves to the left to follow the route of the old Berks and Hants Railway. The Great Western Main Line is on the right and between the two routes is an engineering depot at a lower level, then on the same level as the running lines is Reading TMD where the DMUs used on local services out of London Paddington station are serviced. The depot is known as Triangle Sidings because of a curve that passes behind the depot allowing up trains (towards London) from the Great Western Main Line to become down trains on the Berks and Hants Line and vice versa; this curve is mainly used for freight trains to and from the South Coast. Just beyond the depot lies Reading West, a local station that is elevated above a road at one end but is in a deep cutting at the other. At the far end of the cutting is Southcote Junction where the line to Plymouth curves sharply to the right away from the other Berks and Hants Line to Basingstoke. A third line used to curve to the left to a goods depot but this is long closed and the trackbed blocked by a footpath. The route, which is marketed as the "Kennet Line", follows the River Kennet through the outer suburbs of Reading to Theale. The line passes through Berkshire countryside and local stations at Aldermaston, Midgham and Thatcham. Newbury race course lies alongside the line on the left and has its own station a short distance east of the main Newbury railway station, where the town centre is close by on the right of the line. The station has a bay platform on the right for local terminating trains, and the through platforms are on loop lines that allow fast trains to overtake the local services that continue beyond the town. Some long distance trains also call here. Beyond Newbury the railway follows the route of the Kennet and Avon Canal which crosses below to run on the left side of the line through Kintbury then crosses back to the right before it reaches Hungerford. The line crosses into Wiltshire and the canal crosses back to the left to run close beside the line through Little Bedwyn to reach Bedwyn railway station which is actually in Great Bedwyn. This is the outer limit of the London suburban services and there is a turn-back siding on the right just beyond the station. Long distance trains continue to follow the Kennet and Avon Canal which runs along the line. Beam engines are preserved at Crofton Pumping Station that once pumped water to the summit level of the canal. The canal goes beneath the line in a 500 yards (457 m) tunnel beneath the site of the closed Savernake Low Level railway station, and the remains of the bridge that carried the Midland and South Western Junction Railway. There was never a station at Burbage but the siding served a wharf which allowed transhipment of goods between the canal and railway. Some trains call at Pewsey railway station, where one platform building is a replica of an earlier building but the building on the main platform is original. The site of Patney and Chirton railway station marks the start of a cut-off line that avoided the long loop (to the right) through Devizes railway station on the Berks and Hants Extension Railway. Approaching Westbury, non-stop trains curve to the left to pass under the Wessex Main Line and avoid the complex of junctions around the station, but trains that call here diverge to the right at Heywood Road Junction. Another line curves sharply to the right to join the Wessex Main Line towards Trowbridge at Hawkeridge Junction, a route that forms a diversionary route for the Great Western Main Line. The line curves left past the Panel Signal Box to join the Wessex Main Line in the opposite direction and enter the station. There are sidings on both sides of the line west of the station. On the right are those used for stabling the local DMUs between services, and a Network Rail "virtual quarry" where ballast is stockpiled for distribution. The sidings on the left are mainly used by stone trains from Mendips quarries further west along the line. Our line diverges right from the Wessex Main Line (which continues towards Salisbury) and curves around behind the virtual quarry to reach Fairwood Junction where trains that avoided the station rejoin the historic route, which here was constructed by the Wilts, Somerset and Weymouth Railway. Crossing from "Wilts" (Wiltshire) into Somerset, the line passes through Clink Road Junction, where a branch line diverges on the right to Frome railway station, where a rare wooden train shed survives, and Whatley Quarry. Frome is served by Heart of Wessex Line local services but few long-distance trains call there instead of following the avoiding line to Blatchbridge Junction. The next junction on the right is at Witham, where the old East Somerset Railway carries stone trains from Merehead Quarry and continues to Cranmore. After passing through Bruton railway station, the line passes the remains of the Somerset and Dorset Joint Railway at Cole, and then arrives at the junction station at Castle Cary. Here it curves right, away from the Heart of Wessex Line which continues to Weymouth via Yeovil Pen Mill, a diversionary route that is used when the usual route to Exeter is blocked. The main line is now on the Langport and Castle Cary Railway that opened on 2 July 1906 to shorten the so-called "Great Way Round" via Bristol. After passing through Somerton Tunnel the line soon finds itself crossing the low-lying and comes onto the Somerset Levels and at to Langport and Curry Rivel Junction, where the old Yeovil branch line. used to join from the left, only to diverge right at Athelney to join the Bristol to Taunton Line at Durston. The 1906 openings saw an additional cut-off from Athelney to Cogload Junction where the line joins the route from Bristol, the old Bristol and Exeter Railway. The Taunton and Bridgwater Canal runs alongside the railway. The line passes the site of Creech St Michael railway station and the junction of the former Chard Branch Line. A High Speed Train crosses Langport Viaduct (between Castle Cary and Taunton). Passenger services on the route are operated by Great Western Railway (GWR). These are principally High Speed Trains (HST) from London Paddington to Penzance, Plymouth or Paignton. There is also an overnight Night Riviera sleeper service. Some other services between these places are routed between Reading and Taunton along the Great Western Main Line to Bristol, and then on to the Bristol to Taunton Line, thereby missing this Reading to Taunton line entirely. A few services from London travel only part way along the line, terminating at Westbury or Frome. GWR also provide local services along parts of the line, between Reading and Bedwyn, and between Westbury and Castle Cary. The route is double-track throughout, with passing loops at certain locations. The highest line-speed on the route is 110 mph (180 km/h). The route has a loading gauge clearance of W7 except Reading to Westbury and Taunton to Exeter, which are the larger W8, and is open to rolling stock up to Route Availability 8. Signalling requires four minutes between trains on most of the route, but 8 minutes approaching Cogload Junction and 6 minutes west of Newton Abbot. Signalling is by multiple-aspect signals, controlled from panel signal boxes at Reading, Westbury, Exeter, and Plymouth, and level-crossing boxes at Colthrop (near Thatcham) and Kintbury. Most of the signals are three-aspect, but some sections of two- or four-aspect signalling also exist. During 2010, control of the area currently signalled by Reading panel will transfer to the new Thames Valley Signalling Control Centre at Didcot. The Network Rail Business Plan (2007) states that the heaviest traffic flows are on the section through Newbury, from where there is large commuter traffic to London. The main pinch-point is between Reading West and Southcote Junction where the route is shared with trains to and from Basingstoke and south-coast ports. It is forecast in the report that demand for journeys towards London can be met up to 2016 by increased service levels; three trains each hour will be needed to the west of England. By 2026 seating demand is forecast to be in excess of capacity from as far west as Westbury, and by as much as 14%. There are also significant current traffic levels and predicted growth on local services around Exeter. Taunton train fire, Somerset – sleeping car fire, 6 July 1978. Ufton Nervet derailment, Berkshire – 6 November 2004. The section between Reading and Newbury has been earmarked for electrification by 2018 as part of a scheme to electrify the Great Western Main Line. The electrification of the line to Newbury would allow commuter services to using electrically powered trains to run the entire distance from London Paddington to Newbury. The DfT white paper calls for electric services beyond Reading to be operated by cascaded and completely modernised Thameslink commuter trains from the end of 2018. This would allow the existing DMUs that operate on this section to be cascaded to the Bristol area, the South West and Northern England. In addition to the electrification of the line to Newbury there are to be significant changes to the layout of Reading station. These include the building of a bridge to carry the fast lines of the Great Western Main Line over the Reading to Plymouth Line. There will also be an additional four platforms built on the north side of Reading station to be used for the relief lines whilst the existing platforms will be used exclusively by fast trains to London and the West. Additional plans for the route include the reduction of the distances between signals west of Newton Abbot; making the down loop at Newbury Racecourse reversible to improve train handling on race days; the extension of the turnback siding at Bedwyn to accommodate six-car DMUs; increase line speed as far as Cogload Junction; a third track from there and direct access to the northern bay platform at Taunton; allow tilting trains to operate in tilting mode west of Newton Abbot where the curvature severely restricts speeds for conventional trains. ↑ "Named railway lines". National Rail. Retrieved 24 March 2015. 1 2 3 Leigh, Chris (1988). Railway World Special: Cornish Riviera. Shepperton: Ian Allan Publishing. ISBN 0-7110-1797-2. 1 2 3 4 5 6 7 8 9 10 11 12 MacDermot, E.T. (1927). History of the Great Western Railway. Volume I 1833-1863. London: Great Western Railway. 1 2 3 4 5 MacDermot, E.T. (1931). History of the Great Western Railway. Volume II 1863-1921. London: Great Western Railway. ↑ Railway Electrification. British Railways Board (Central Publicity Unit). Winter 1979. pp. 0–2, 8. 1 2 "National Rail Timetable 135 (Winter 2007)" (PDF). Network Rail. 1 2 "National Rail Timetable 116 (Winter 2007)" (PDF). Network Rail. ↑ Oakley, Mike (2006). Somerset Railway Stations. Bristol: Redcliffe Press. ISBN 1-904537-54-5. 1 2 3 "National Rail Timetable 123 (Winter 2007)" (PDF). Network Rail. 1 2 3 "Network Rail Business Plan 2007: Route 12" (PDF). Network Rail. 1 2 "Baseline Declaration: Track and Route Mileage: Line-speeds: Western Route" (PDF). Network Rail. ↑ "Route Plans 2009: Route 12 - Reading to Penzance" (PDF). Network Rail. ↑ Department of Transport; Major A.G.B. King (1980). Railway Accident: Report on the Fire that occurred in a Sleeping-Car Train on 6th July 1978 at Taunton in the Western Region, British Railways. HMSO. ISBN 0-11-550513-X. ↑ "Six die as train ploughs into car". BBC News. 7 November 2004. ↑ "DfT White Paper: Rail Electrification" (PDF). Department for Transport. ↑ "Reading Station Map" (PDF). Network Rail. Beck, Keith; Copsey, John (1990). The Great Western in South Devon. Didcot: Wild Swan Publication. ISBN 0-906867-90-8. Great Western Railway (1924). Through the Window. Number 1 – Paddington to Penzance. London: Great Western Railway. Hesp, Martin (7 July 2008). "My magnificent rail journey". Western Morning News. Western Morning News. Retrieved 14 July 2008. Wikimedia Commons has media related to Reading to Taunton Line.